A bodybuilder from Samoa is the new Mr. American Samoa. Peniamina Matale-Fili, 21, of the Bodybuilding Federation of Samoa, was crowned the Mr. American Samoa Overall Bodybuilding 2018 during the weekend. 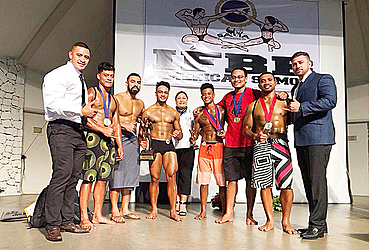 This marks another successful achievement of the Bodybuilding Federation of Samoa. The competition is a partnership between the American Samoa Mr. Sau Ia International Bodybuilding Federation and the Bodybuilding Federation of Samoa. Matale-Fili is the son of Siuli Petaia and Petaia Matale-Fili from the villages of Faleula and Satuiatua and Neiafu in Savai’i. For Matale-Fili, this is his second time competing in the bodybuilding competition. Mr. Matale-Fili stated his career began from his daily routines at home. He later joined the fun at Joe’s Gym, and that’s where the door opened up for him, competing for the Bodybuilding Federation of Samoa started off. Mr. Matale-Fili says it took him a whole year preparing for his first bodybuilding competition, and two months for the American Samoa Title. He also mentioned that he has been working and learning so much from the current Mr. Samoa Mr. John Lemoa through his preparations. Mr. Matale-Fili is excited and proud of his achievement; especially winning a competition on international stage. He mentioned that it’s a dream come true for him but he also believes this is an exciting start of a new chapter of his life. Mr. Matale-Fili also added that he is now eyeing Oceania bodybuilding competitions.